Revived on TV by Whoopi “I have no eyebrows” Goldberg, the show Hollywood Squares takes Tic-Tac-Toe, applies a celebrity to each square, and then chooses two completely starstruck morons to play. This could very well be the easiest gameshow on Earth. The celebrities are the ones who really answer the questions, and the players only have to agree or disagree. That’s why they ask questions that no one cares enough to know the answers to, and pluck contestants right off the streets of North Hollywood – they look good, but they’re just as dumb as the sand that makes up Venice Beach. With this in mind, you might think that Squares would not be a great idea to make a video game out of. You’d be right. 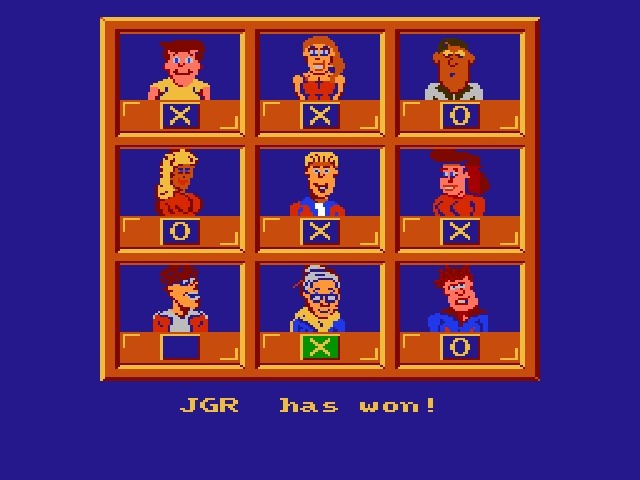 The game tries to adequately portray the “fun” and “excitement” of being on the show. 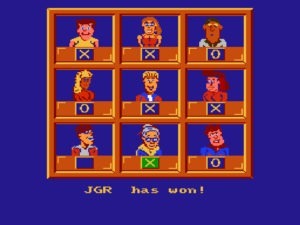 One or two players take turns playing through the game according to the show’s rules. 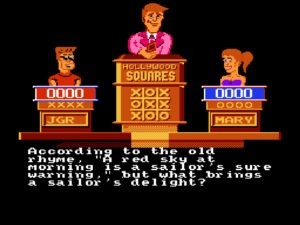 Try to get three in a row, answer a question correctly and you get the square, if not the other player does. Of course the big draw of the show is meant to be the celebrities, usually comedians, who offer humorous remarks about the questions before giving their real answer. The original Squares had class acts like Don Adams, Buddy Hackett, the Man himself Uncle Milton Berle. The game treats you to the comic stylings of Beth, Mike, and Val. These characters are just as lifeless as their names, and equally insipid. Granted, this is the NES. Yet no attempt has been made to give a personality to each character, or to make them something to laugh at. That could have been done with some care, and maybe should have been done considering that these characters are supposed to be driving the game. The designers didn’t totally pooch the concept though. Each question does come with a pre-written humorous comment. Some of these are funny, most, well, are not. The characters don’t have different comments for the questions either, so every character will say the same thing when the question comes up. To be honest, I was expecting the game to pick the comments at random, so this is a better setup than that would have been. At least what they’re saying makes sense. And also, each time the question comes up, a random answer will be given. You still only have to agree or disagree, but it doesn’t make it quite so easy to just remember the answer for the next time. No, it's the NES, so the "celebrity" won't make the obvious joke. Speaking of, by the second game I was already getting questions recycled from the first. I don’t know exactly how many questions the game comes with, but it can’t be too many. Not that it matters though, you’ll win most games you play. Out of four games, I won three when my computer opponent missed her first question, lining me up to win. Each game consists of three matches, but conveniently the third match has the same point value as the first two combined, probably to keep the game going. If you win against the easy AI, which you will, you get to pick one of five keys and then one of five cars. If the key fits the car, you win it. Well at least in your own fantasy land. After that, you can continue to play matches until you get bored, which you’ll realize was actually in the middle of the first game you played. The graphics in the game are pretty good. All characters have only two expressions that they alternate between, and the “set” looks faithful to the show. Sound also isn’t bad, with good themes and some nice timer/buzzing in effects. It’s too bad that the game isn’t fun. If you like the Squares then you might enjoy this for a little bit. Otherwise, there are no celebrities here or fun moments that make the show bearable. The trivia isn’t interesting, and it’s not very difficult since the AI never puts up a real fight and you automatically have a 50/50 chance to get every answer right. So take away the comedians and the trivia, and you’re left with a game of Tic-Tac-Toe. And let’s face it, that game was so boring that it made Dr. Falken’s defense computer want to give up on protecting the U.S. and go play chess instead.